On Tuesday, November 13th, 2018, Heritage NL folklorist Dale Jarvis interviewed special guests Darlene Redmond and Michael Pretty at the Annex, Admiralty House Communications Museum, as part of a live audience recording of the Living Heritage radio show and podcast to commemorate the 100th anniversary of the signing of the Armistice. Darlene Redmond is an artist who has always had a keen interest in history and war. She admires the care and dedication given by the people of this province in preserving the history of the Royal Newfoundland Regiment and created the series to contribute to a proud legacy. She lives with her husband and children in Mount Pearl. 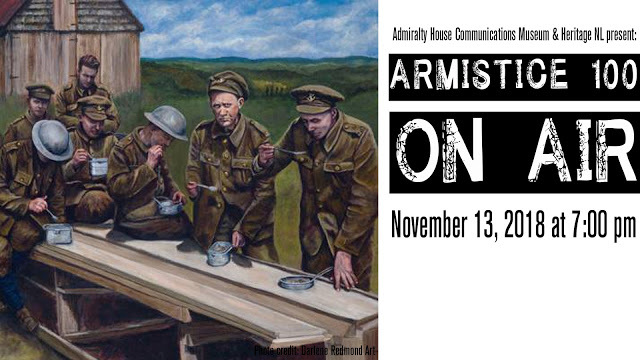 Darlene's work will be featured in Admiralty House's new exhibit "Armistice 100."